Do you ever find yourself thinking, "I wish there was a _______ made just for twins?" Parents of twins, who find their homes overrun with twice the equipment for babies and kids, often wish that there were products designed with multiples in mind. Fortunately, there are several companies who sell such things. Some are inspired by a creative parent of multiples seeking a solution to make life easier, while others are from corporations who recognize the particular needs of parents of twins. These products range from extravagant luxuries, like the rocking chair for twins, to everyday necessities, like a shopping cart cover. While there is still a long way to go to make the world totally twin-friendly, these products may help just a bit. Do you sell a product made just for twins? Let me know about it! Contact information can be found on my info page. Like many products for twins, the Twin Z feeding pillow was invented by a mom of twins. Michelle was a new mom of twins when she sought out a product to make breastfeeding more comfortable. On her website, she says, "I wanted a pillow that I could breastfeed comfortably and happily in. I wanted to enjoy this time with my babies, not be in pain and dread it. And I wanted a pillow that was one piece that they could bond together in." The Twin Z feeding pillow provides support for mom and babies during tandem breastfeeding. The unique design gives full back support to Mom as she holds both babies. This pillow goes beyond a standard nursing pillow, with two slots to accommodate two babies for bottle feeding or play time. Use for tummy time with twinfants, or to support older babies as they learn to sit up. Made in America with baby safe materials, the Twin Z pillow is hypoallergenic, foam free, lead-free, and without chemical additives. boppy chair, feeding pillow, double. With only two hands, parents of twins may have difficulty juggling both babies at the same time. There are times when you want to carry both babies, but also keep your hands free. The TwinTrexx Baby Carrier was designed by a mother of multiples to solve that exact problem. This versatile baby carrier allows one person to carry two babies, either facing in or out. A newer model also can be configured to carry babies side to side or front and back. The product can also be used separately for carrying single babies. One of the largest producers of mainstream baby products, the Graco company does seem to seek solutions for parents of twins in their product line. Their double stroller products have remained popular for years. This innovative marketing of a Pack 'n' Play Playard includes two bassinets to accommodate newborn twins up to fifteen pounds each. While I think that a freestanding play yard is a better alternative for older twins, the A Pack 'n' Play is a useful piece of baby equipment that can function as a playpen or portable crib for older babies, (preferably one at a time, especially if they're bigger). And if offers the additional benefit of serving as a temporary or on-the-go crib for younger babies while they sleep in the bassinets. It can really be a challenge to feed two babies at the same time. Traditional high chairs are bulky and expensive, and take up a lot of valuable real estate in a family's kitchen. They're full of cracks and crevices that are difficult to clean, and wrangling two babies into the chairs with trays can be a headache. For about the same price as two high chairs, you can buy a sleek feeding table with two seats for twins. (They're also available configured for triplets or more!) There are lots of neat features with this table. The seats can be removed and washed in the dishwasher, and the height of the table is adjustable. Once your twins outgrow the "high chairs," the table functions as a play table or activity table, and will remain useful for years. Priced at $8,500, this is not a piece of baby equipment that will find a home with most families. But I love the innovative design, and it would certainly create some beautiful memories. Many parents of twins lament the difficulty in trying to find cuddle time with both twins or trying to read with twins when they compete for lap space. This rocking chair with two "wings" on either side creates the perfect twin perch and solves such problems. Step 2 Caterpillar Swing for Two. Photo courtesy of Step 2 company. 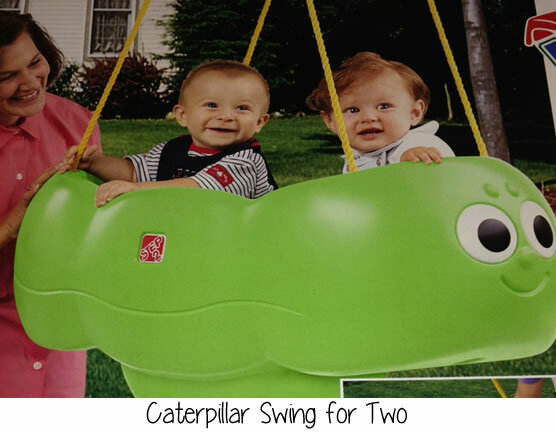 The Step 2 company no longer manufactures the Caterpillar Swing for Two, but it's entertained so many generations of twins that it deserves a mention here. It's so perfect for young twins. Check your local twins club sales - you might get lucky and score a used one. The Step 2 company's blog acknowledges that the double swing was a popular item, but suggests using two single swings as an alternative. I think there must have been some safety issue associated with double swings that make them prohibitive to manufacture, as the Little Tikes company no longer makes a double swing either. This innovative product lets two babies enjoy floating in the water together -- and makes it easier for parents to keep an eye on them. This inflatable float for babies has two seats. It can be difficult to find but is currently available to order online from Stuff4Multiples.com. Is the Baby Jogger City Mini Double Stroller Good for Your Twins?